Tree, stem up to 15 m tall or taller, distinctly annulate, ± flexuous, base thickened. Leaves spiral and clustered at the distal end of the trunk, pinnately compound, 4-5 m long; leaflets c. 1 m. long., coriaceous, flaccid ; petiole 1.1.5 m. long, channeled, stout. Inflorescence a spadix, c. 1 m. long., branches flexuous; subtending spathe c. 1 m. long, oblong, hard and fibrous, splitting lengthwise. Flowers unisexual, green to yellowish green, both male and female flowers are in the same inflorescence; male fl. small; female c. 2.5 cm long, 2-bracteolate, disk annular. Fruit a nut, up to 25 cm. length and width, trigonously obovoid or subglobose, green or yellowish; exocarp fibrous, seed coat hard, endocarp fleshy and oily. 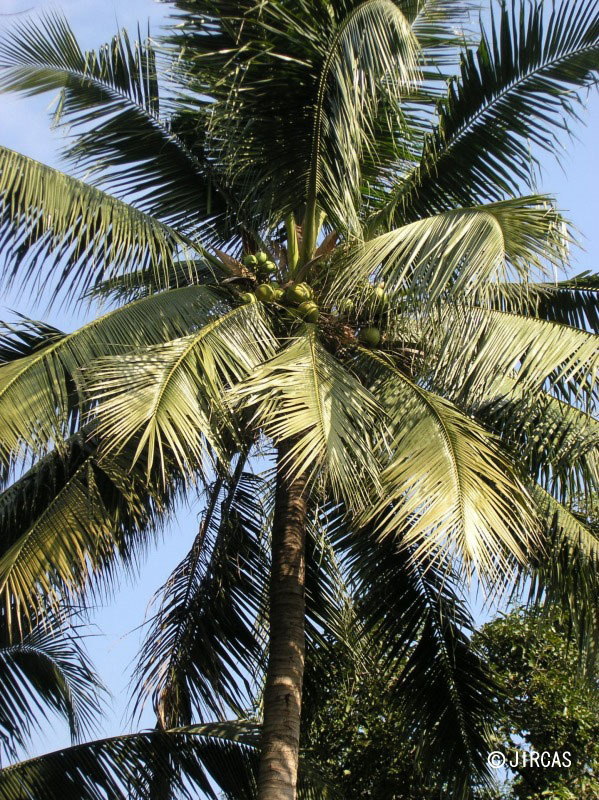 Coconut trees are grown commercially in Thailand and elsewhere mainly for their fruits. However coconut palm heart is popular among Thai as vegetable. 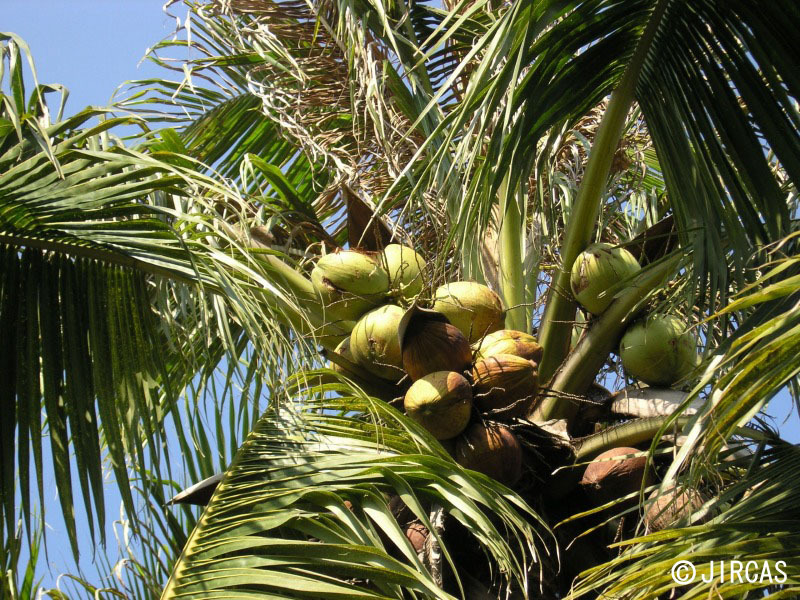 Few plantations have been established recently to produce coconut palm heart. Selected cultivars are planted at closer spacing, c. 1.5-2 m. apart. Palm heart is ready for harvest within 2 years. 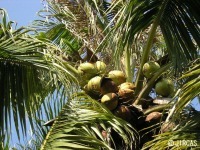 Nowaday coconut palm heart is available year round in Thailand. 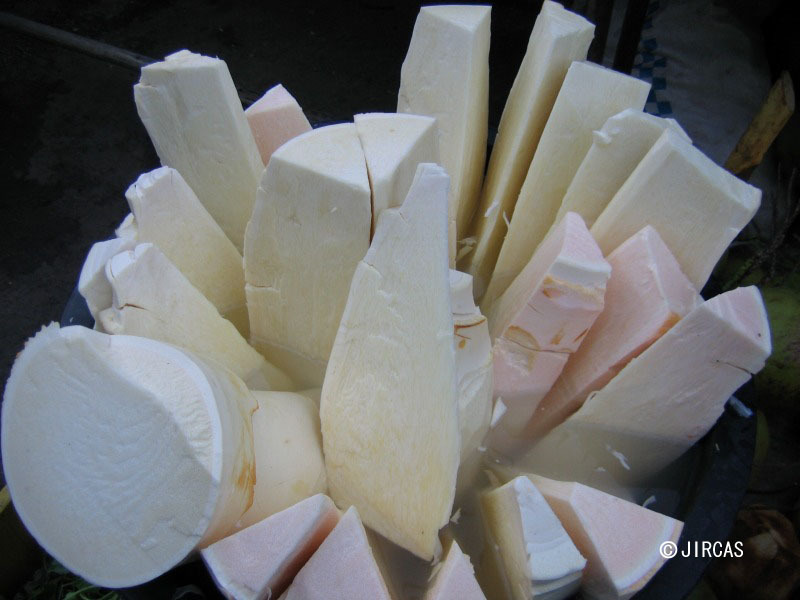 They can be cooked as fried vegetable or added to various curry dishes.